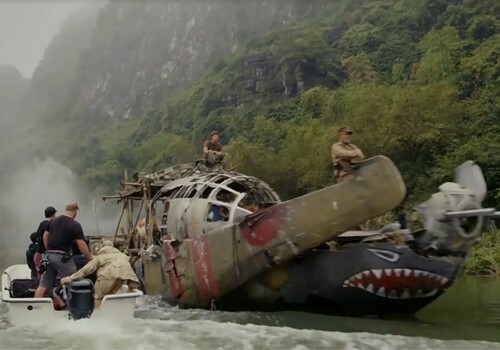 The cast and crew of "Kong: Skull Island" filming in Vietnam. 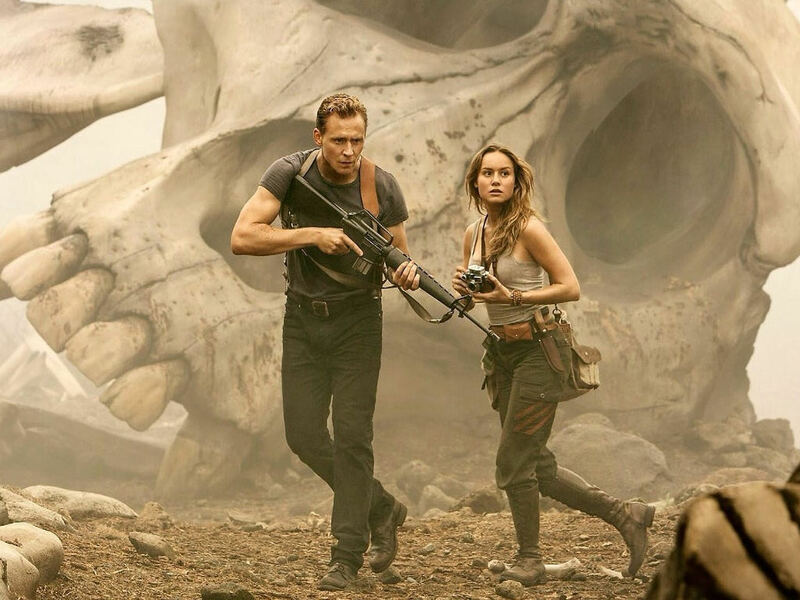 "Kong: Skull Island" is king at the cinema! 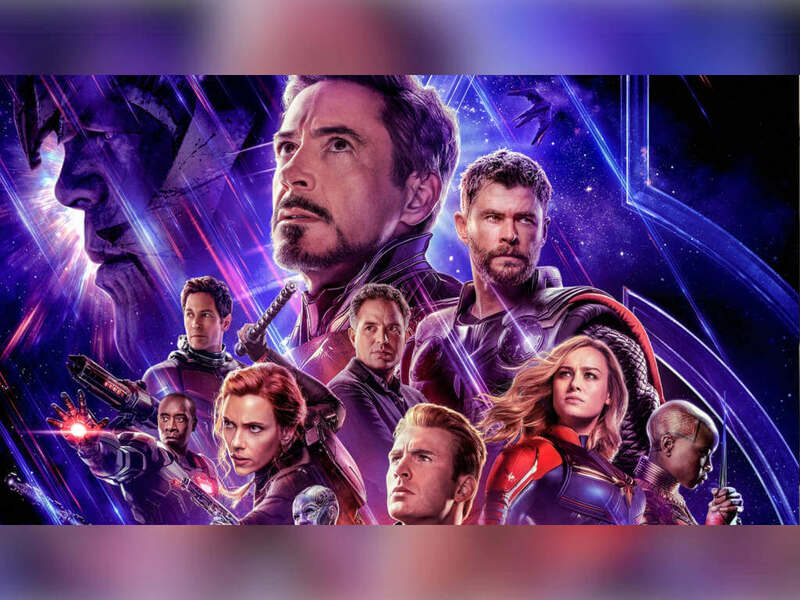 Released recently, reactions toward the movie have been largely positive. 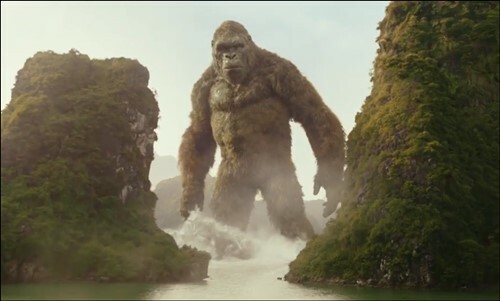 It cannot be denied that the next entry in Legendary's MonsterVerse, which also serves as the reboot to the "King Kong" franchise, has awed fans not only with its colossal Kong but also with its visual aesthetics. 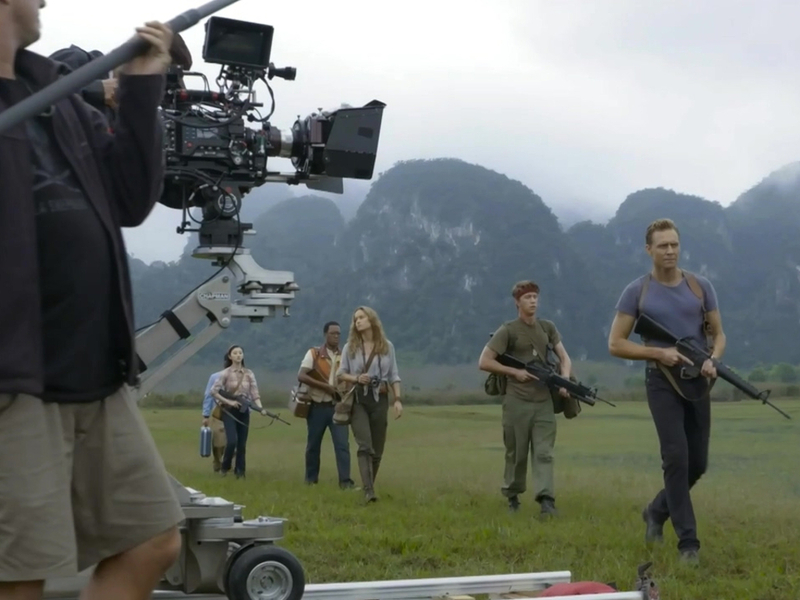 With a story set in Vietnam, director Jordan Vogt-Roberts travelled across three continents to make full use of some of the most scenic locations on the globe to bring the feature adaptation to life. Part of the tribal village was shot in Hawaii, when production began there in October 2015. 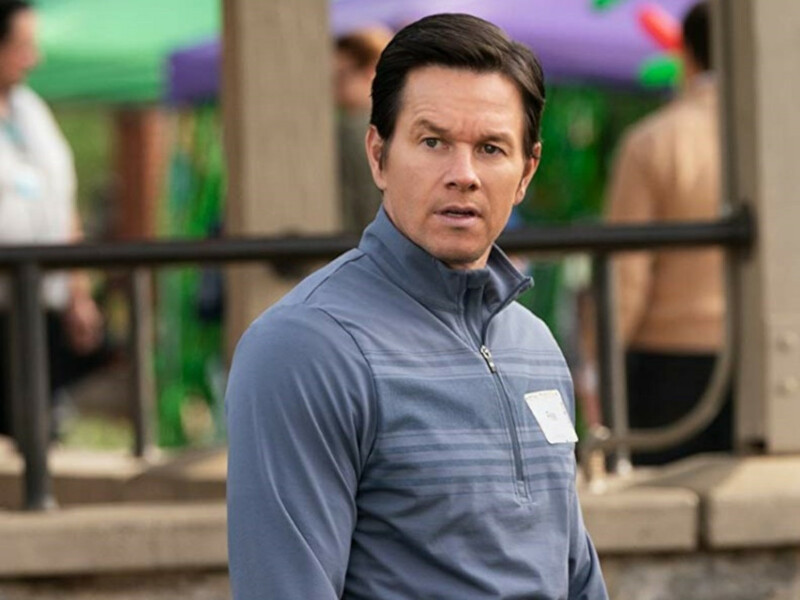 The rest of it was filmed in Vietnam itself, the final on location shooting set in March 2016. In between, the cast and crew were in Australia, filming the plane crash scene. 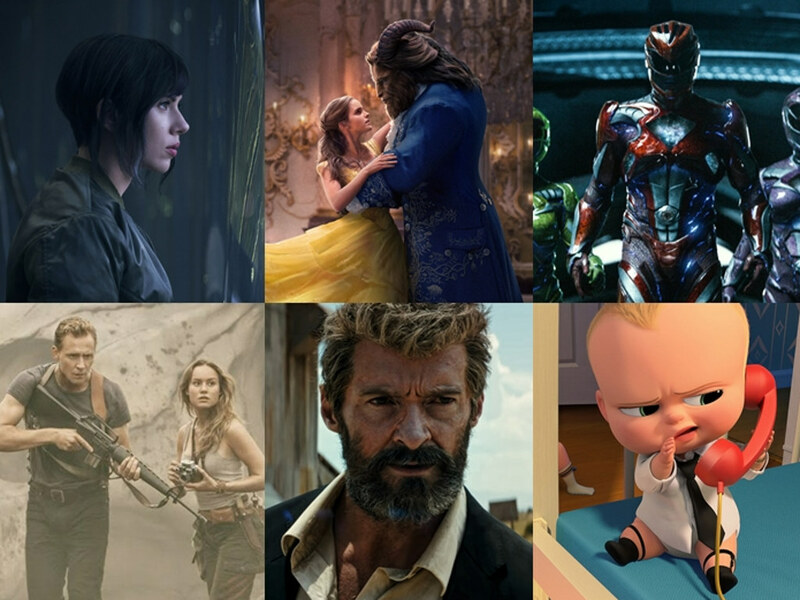 All of these merge seamlessly on the big screen, creating a breathtaking universe that leaves viewers completely immersed in and enchanted by the movie. Kong looms over the peaks in Vietnam. Cinema Online visited the set in the Ninh Bình Province in Vietnam early last year. The production occupied a large area, consisting of the base camp and the filming site. 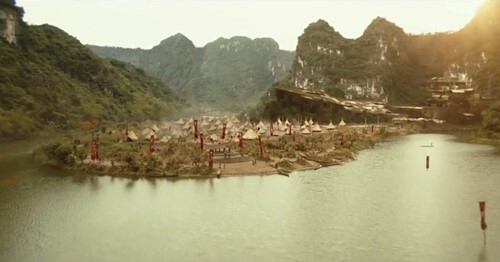 There was a short travelling distance, roughly five minutes, from the base camp (where the cast and crew gathered for makeup, lunch and to rest in trailers) to Heatstroke Island (where filming took place) – so named due to the unpredictable weather at the filming site that could vary from scorching hot to heavy rain on any given day. However, during our set visit, the weather was cold with sprinkles of light spring rain every now and again. We observed some of the cast: Tom Hiddleston, Brie Larson, Jing Tian and Thomas Mann, while they were filming. 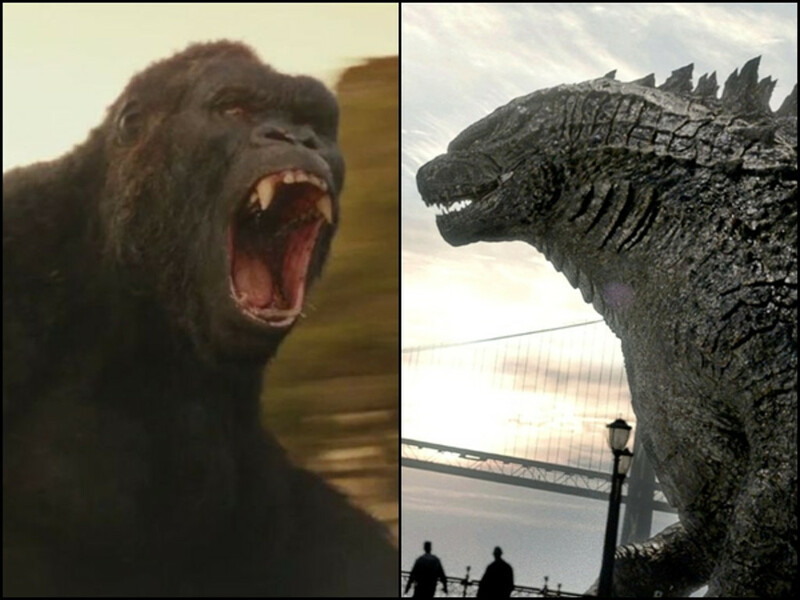 The movie's lineup also includes Samuel L. Jackson, John Goodman, Toby Kebbell, John Ortiz, and Terry Notary, who provides the movements of Kong, though not all were on set that day. The moment we stepped on set, it was easy to see why the Hollywood production decided to film there. The jagged limestone peaks and hills in Ninh Binh lent a certain ambience to the movie that cannot be captured elsewhere. 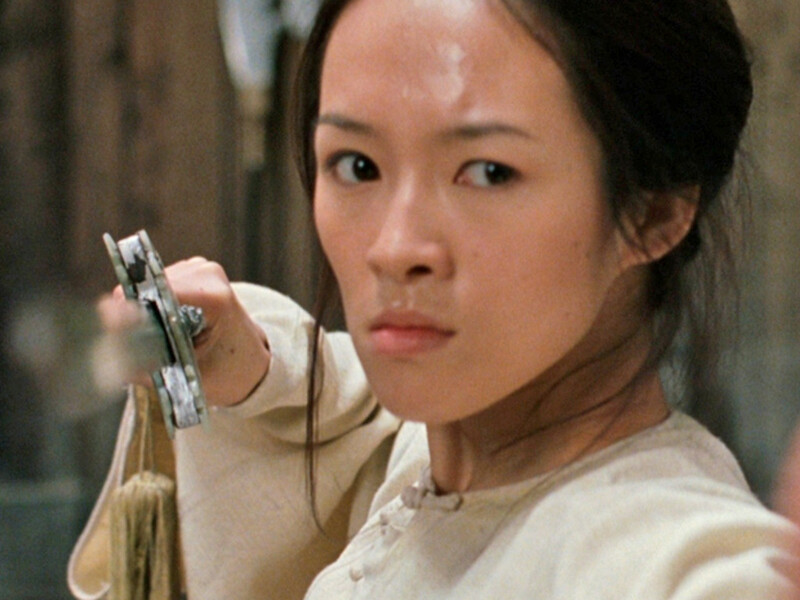 It makes for a truly Vietnamese backdrop, providing authenticity to the movie. The still lake was vast and made for a scenic landscape. Not much shooting was able to be done on the day due to the gloomy weather, we only managed to linger by the lakeside and watch the scenes being filmed on the lake. Though while we didn't get to watch any shooting get done on the village set, which is located on a patch of raised land a little further beyond the lake, we did get to visit it and explore the tribal setting. An area of Heatstroke Island is transformed into this tribal village. The rain had made the ground muddy and slippery, and the village was still under construction at some parts, but that did not take away from the awe of experiencing it firsthand. The craftsmanship of the huts and the details put into the props (campfires, bowls, vegetables hanging on the walls of the hut, etc.) could easily convince the audience that it was a real village populated by an actual tribe. 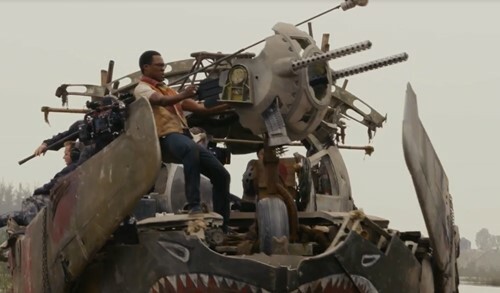 The first shot we were witness to on that drizzly morning on set was of a stunt double for John Ortiz (who plays senior Landsat official Victor Nieves) getting propelled high into the air. 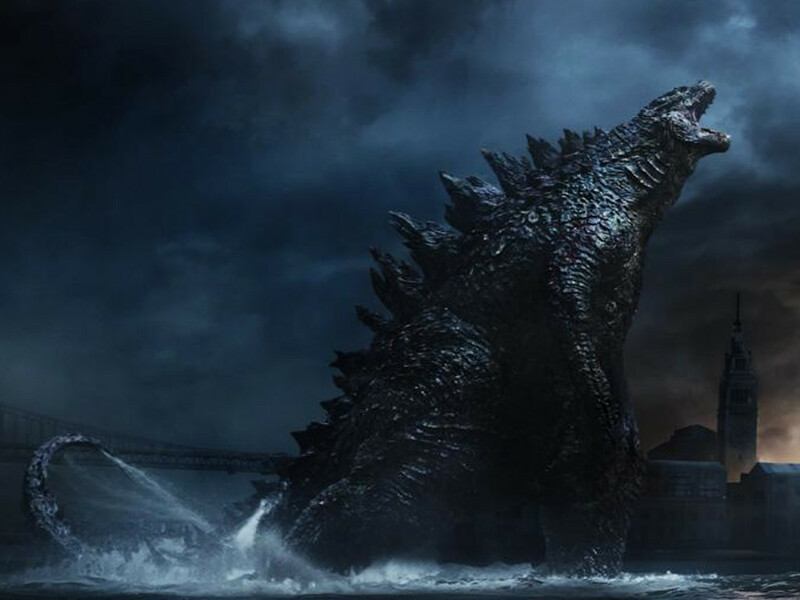 The feat was done with a high-powered crane, from which he dangled from for a few seconds every time after he was jerked off his feet and propelled into the air several feet above the lake, mimicking the action of being snatched off the ground by a massive beast. When you're watching a movie, you probably won't think much of the work that goes into the scene you're watching. 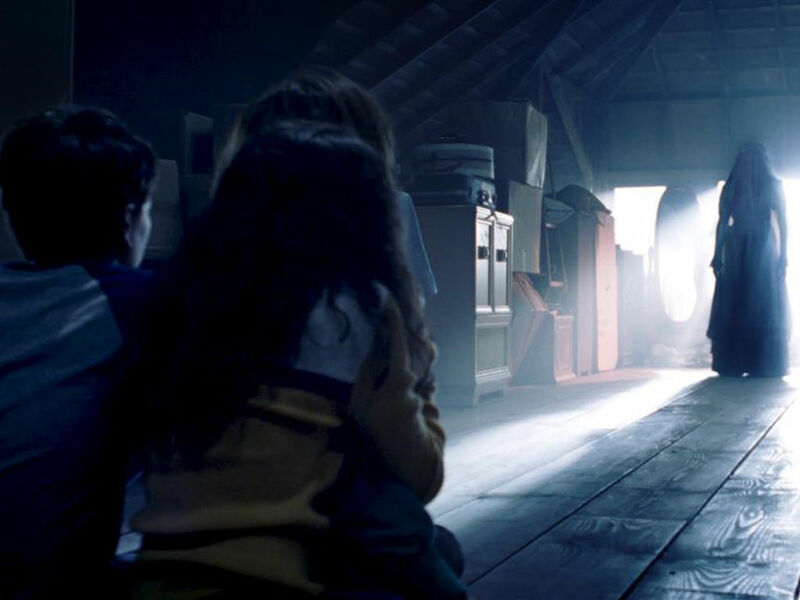 The "snatching" we were seeing unfold in front of our eyes may only appear for a few short seconds in one particular scene but the filming for that alone took more than a few long minutes. The boat is made to look like it was built from a crashed plane's salvaged parts. As mentioned, not much shooting was done, so we only got to see the snatching stunt and later listened to a lot of "fire in the hole!" as the cast filmed a scene on the boat, which involves very loud gunshot sounds in every take. This filming was done in the middle of the lake, so we could only stand and watch from the lakeside. 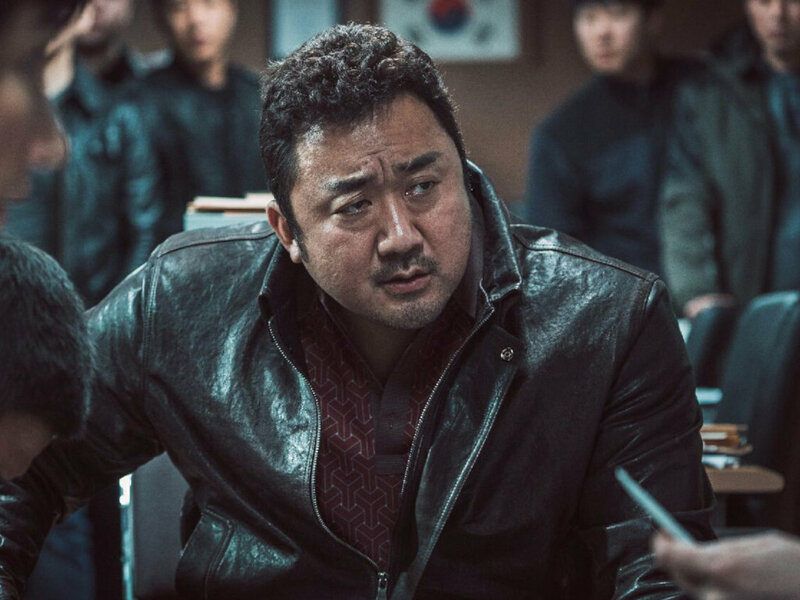 Every time a crew member yelled out the cue for the gunshot, everyone had to cover their ears to shield them from the deafening, thundering sound! We didn't get to witness the cast manoeuvre the winding rivers or the vast lake but we were informed they did this the days before and it was certainly a task, especially for ones with taller frames when they had to pass through narrow passages. On the day we arrived on set, Samuel L. Jackson had wrapped up filming so we didn't get the chance to hear him crack a joke in real life. We did, however, had the pleasure of talking to the director, Jordan Vogt-Roberts, and main cast Tom Hiddleston and Brie Larson! 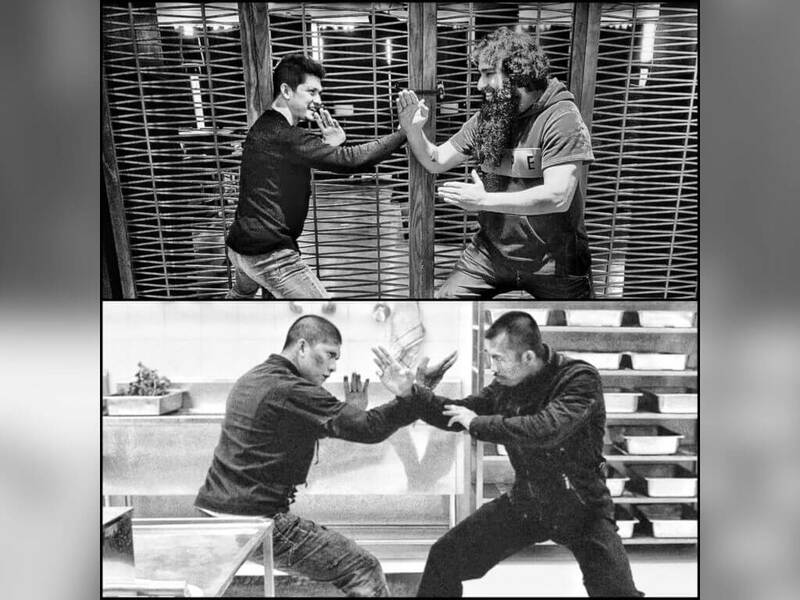 "Vietnam is the perfect place," said Vogt-Roberts when asked why he chose to film in the Southeast Asian country. Since the movie's storyline does tie-in with the Vietnam War, it only made sense that the country gets to be one of the prime locations. But that's not all, it was the surreal, sweeping landscape of Vietnam that truly enamoured the director. "I want people to know more about the country, I want them to watch the movie and think they want to go there," he explained, his notion akin to how the "Lord of the Ring" franchise impacted the New Zealand tourism industry. 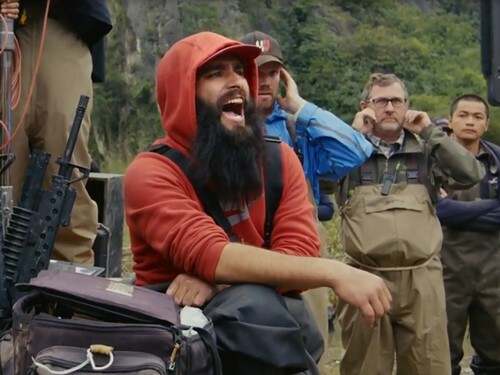 Director Jordan Vogt-Roberts yelling out "Action!" on set. Being a busy man, the director didn't stop long for a chat. 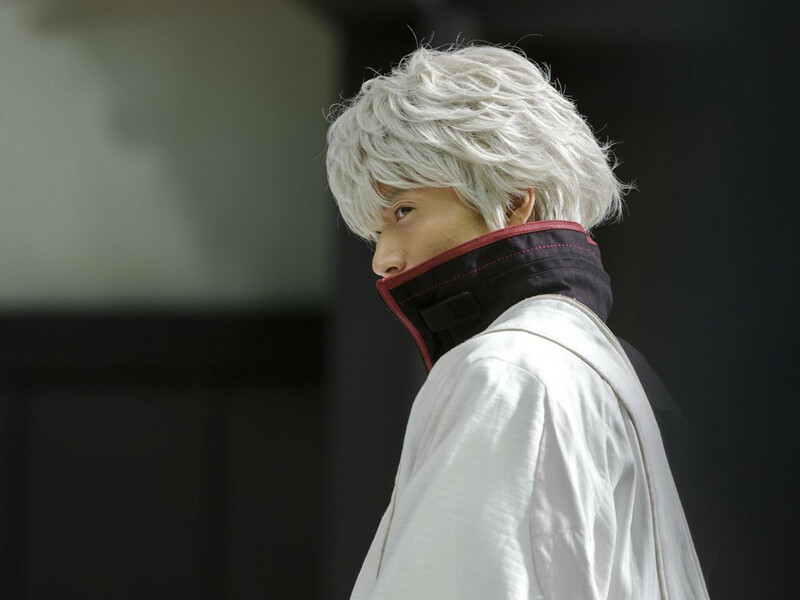 Soon he was already off to another part of the set, ready to yell out "Action!". Actress Jing Tian came by our camp but unfortunately, the Chinese actress was only able to do a short interview with the Mandarin-speaking media before she was also whisked off to another part of the set somewhere. We caught up with Hiddleston and Larson after they were done filming on the boat in the middle of the lake. 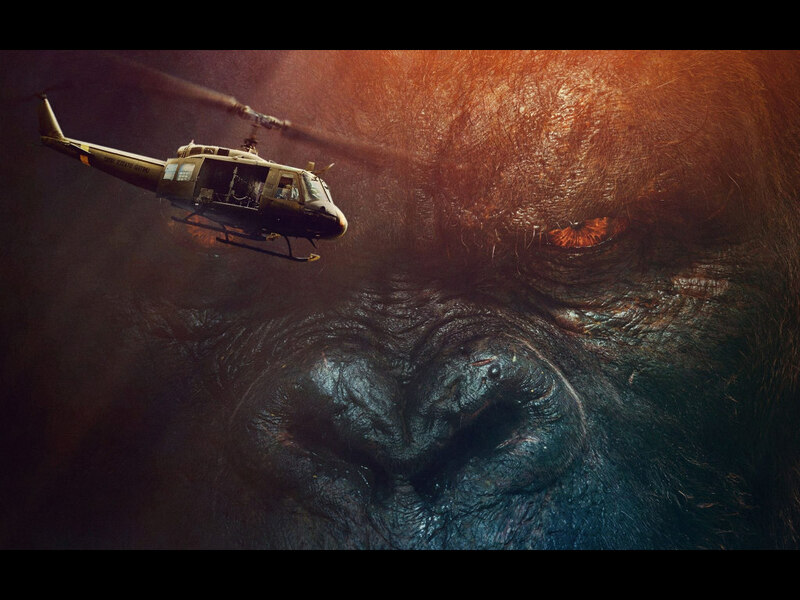 Read our exclusive interview with them (scroll below for the link to the article: Exclusive interview with "Kong: Skull Island" stars) to know more about their experience riding a door-less helicopter and everyone's reaction to Larson winning Best Actress at last year's 88th Academy Awards. While at the base camp, we were given a tour of the costume and makeup tents, which were located along the edges of the camp since the middle was occupied by the cast and crew's trailers (which, of course, we were not allowed into). The real highlight was at the makeup tent where we got to see how the look of the Iwi people, the indigenous tribe on Skull Island, was created. 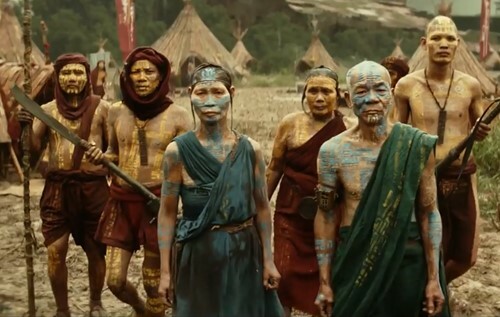 The tribe mostly wore red or blue so the villagers, played by local Vietnamese village dwellers, wore different coloured costumes and had body paint with corresponding hues. The intricate patterns were painstakingly painted onto the villagers every day, there are sheets of papers with the correct body paint pattern and style for each type of villager pasted around the makeup mirrors so the makeup artists could keep track of their look and keep the continuity. The villagers' tribal costume consisted of simple one-piece or two-piece clothing, paired with simple, handmade footwear. Since most of the men had shaved heads, their painted tattoos extend to their scalps. The body paint may not seem practical but it does elevate the aesthetic appeal of the already impressive movie. Enjoy the monstrous excitement of "Kong: Skull Island", showing in cinemas now! 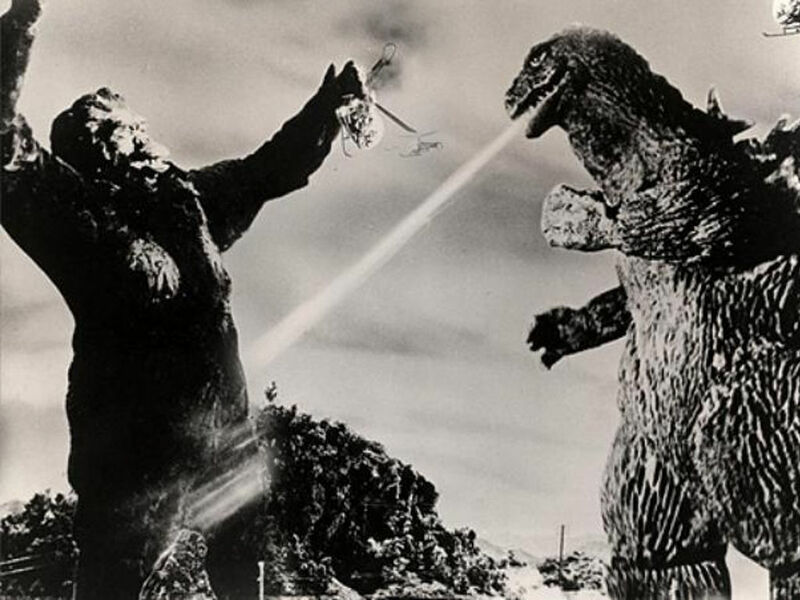 Did you know there are 30 "Godzilla" movies? 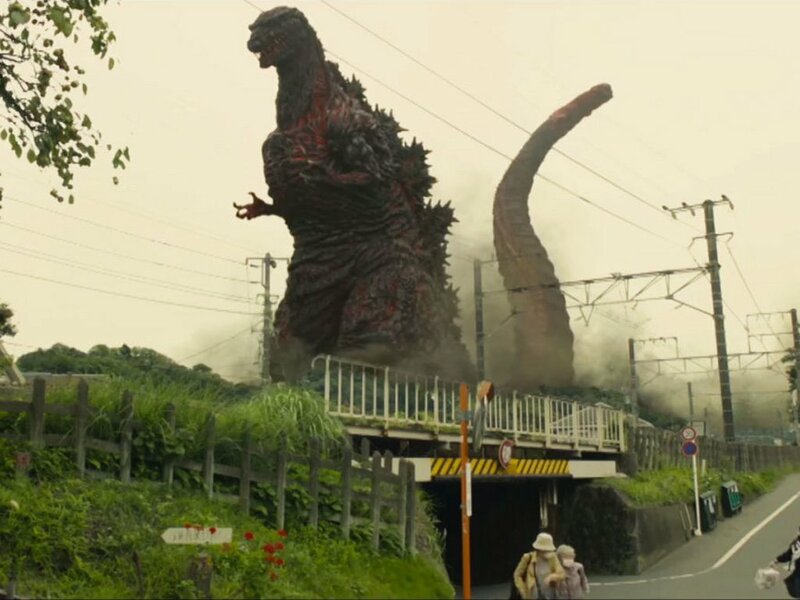 We evaluated all the past Godzilla movies for you before its latest entry this year! 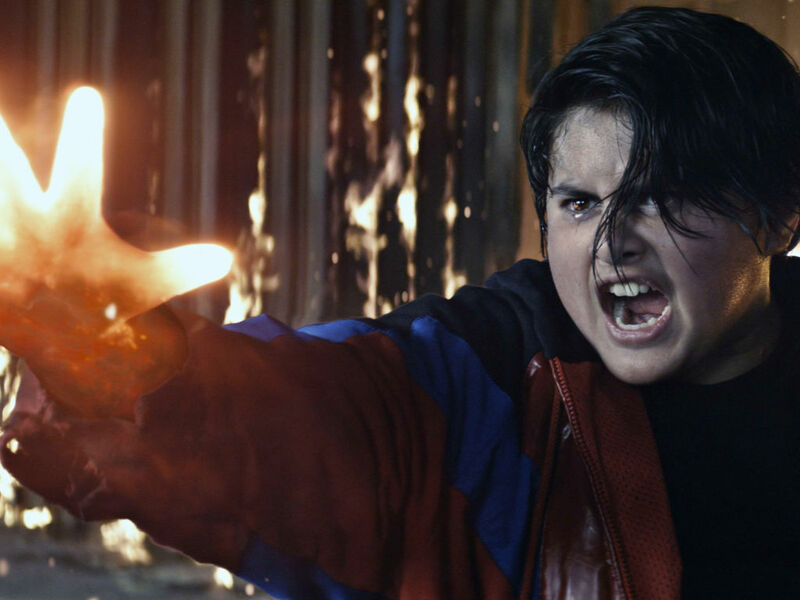 "Logan", "Beauty and the Beast", "Power Rangers" and the movies you shouldn't miss this March! 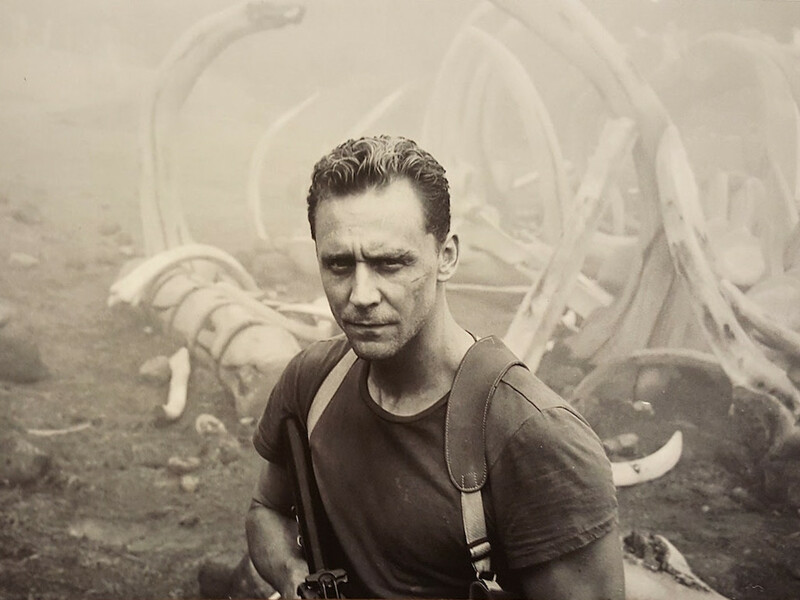 5 gargantuan reasons to watch "Kong: Skull Island"
Because Tom Hiddleston alone is not reason enough for you. 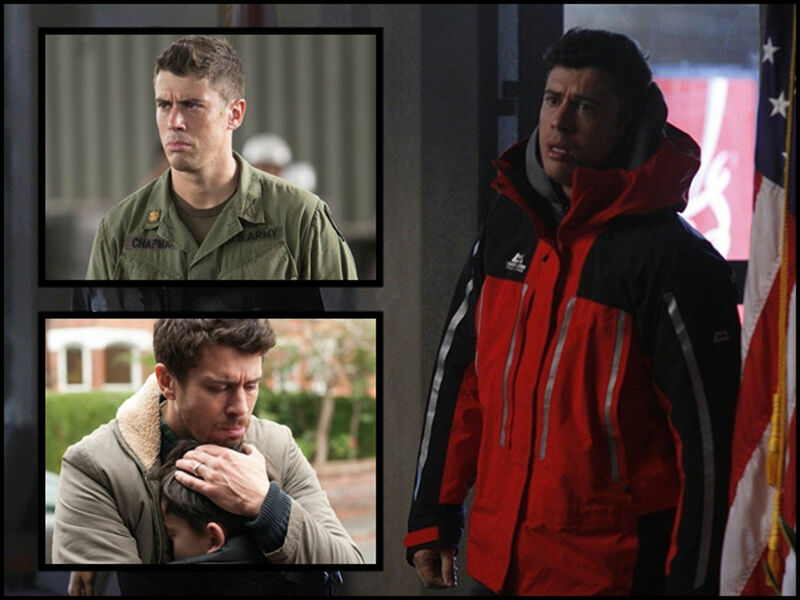 Who's who in "The Hurricane Heist"
Also, do you remember which movies the cast members have appeared in before?